According to several well-known international travel magazines and tour operators, Hoi An Ancient Town in the central province of Quang Nam is a leading ‘food paradise’ with diverse, tasty and cheap dishes. With this reputation, the combination of travelling, learning and enjoying local specialties has become increasingly popular and attracts a large number of visitors each year, particularly foreigners, to the ancient town – a World Cultural Heritage. The travel site Lonely Planet has listed learning to cook in Hoi An as among the top ten ‘best travel experiences on the planet’. In addition, on the intentionally renown travel website TripAdvisor, tours to discover cuisine and cooking classes in Hoi An also received significant positive feedback. This form of tourism has brought visitors authentic experiences of the delicious and typical dishes of Quang Nam province, as well as offered them opportunities to immerse themselves in the daily life of the local people and learn more about the unique cultural identities here. Cooking classes, organised by restaurants, hotels and travel companies, are comprised of going to local markets to buy ingredients, cooking under the instruction of skillful chefs, and enjoying the dishes. The recipes for cooking local specialities, such as bun bo (beef noodle soup), cao lau (Quang Nam style noodle), and banh xeo (Vietnamese style crepe with shrimp, thinly sliced pork and bean sprouts), have been favoured because they are easy for visitors to make. The tourist from the US Carol Miller said that trying out the role of a chef in Hoi An was an amazing experience. With a list of suggested dishes, she and other participants went to the local market to buy the needed ingredients and meet local residents. They were then instructed on ways to make simple traditional food and enjoy dishes cooked themselves. The open and simple space for courses, as well as the enthusiasm and friendliness of instructors and local people, creates a sense of familiarity with visitors. With its unique geography and history, many dishes in Hoi An come from a mix of many different cultures, according to Diem Vy – a prestigious chef in the ancient town. Additionally, the experience accumulated over many generations has made Hoi An cuisine more diverse and attractive, enchanting even the most discerning travelers. Most tourists enjoy the experience of cooking Vietnamese food. They also noted that they would tell their friends about the experience and cook dishes that they learned in Hoi An for their relatives to enjoy. 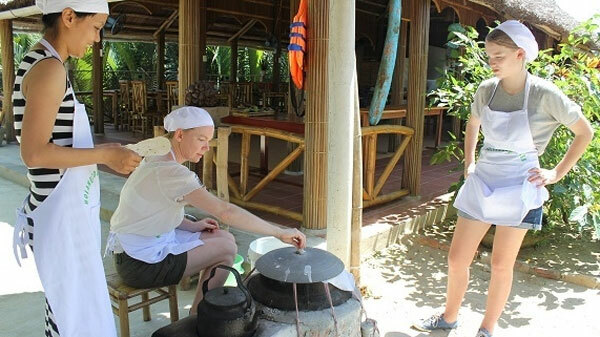 Currently, tours combining learning to cook with community-based tourism and ecotourism are the choice of numerous international visitors to Hoi An, particularly from Western Europe, the US, Australia, Japan and the Republic of Korea. Normally, each class has from five to 15 visitors with prices ranging from VND300 to VND800 per person, depending on the menu. Hoi An Ancient Town has become one of the top destinations in Vietnam with a large number of visitors, particularly foreigners. The culinary tourism has significantly contributed to not only promoting the culture and lifestyle of local people in the town’s centre, but also introducing visitors to neighbouring trade villages, including Tra Qua vegetable village, Thanh Ha pottery village and Hoi An silk village.